Jacobs Ladder is an eight pitch rock climb on Exfoliation Dome, near Darrington Washington. 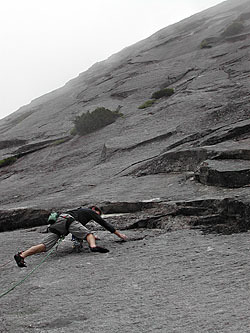 Established over a three year period, 2001-2004, the climb features a variety of climbing on solid granite, and it is generally well-protected but by no means a sport climb. It starts with two pitches of low-angled slab (runout but easy), then steepens for five pitches of crack and face climbing at a fairly sustained level of difficulty - mostly 5.9 to 5.10 - with the hardest climbing being bolt-protected face climbing. A full rack is needed, however; bring gear from 1/4" to 4" along with ten draws and some longer runners. The belay stations have chains, and the route it set for rappelling. For more information about the area, see my on-line guide (LINK) . The approach to the climb follows the "Granite Sidewalk," an exposed slab climb in its own right and not something to be taken too lightly. Hike and scramble for about a thousand feet and then cut left below the slabs beneath the main west face wall. Ferns and anenome frequently obscure the trail here. As noted above, the route begins with two pitches of lower angled slab climbing. To find the first pitch, look for the right-facing flake in the picture at upper left. This flake is adjacent to expansive, low angled slabs below the central west face of Exfoliation Dome. The second pitch is longer than a rope length, but climbers ready for the challenging upper pitches can easily simul-climb to allow the leader to reach the belay. After two pitches, the route steepens to about 65 degrees and changes in character. Pictured at left is Chuck Spiekerman eyeing the crux moves, which come on the fourth pitche. 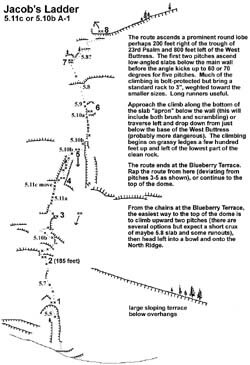 Above here is a wild face-pitch on down-sloping holds, followed by two pitches of mostly face-climbing along a dike, and then a wandering rightward pitch to the "Blueberry Terrace" where the route joins other lines on the Dome. A Topo is provided HERE . I've down-graded the climb since I prepared the topo, but the drawing is accurate.